This blog has been live for a week now and I want to thank everyone for their support so far! I have a Facebook Page set up now where I will post a few other bits and pieces and you can keep up to date on new recipes. 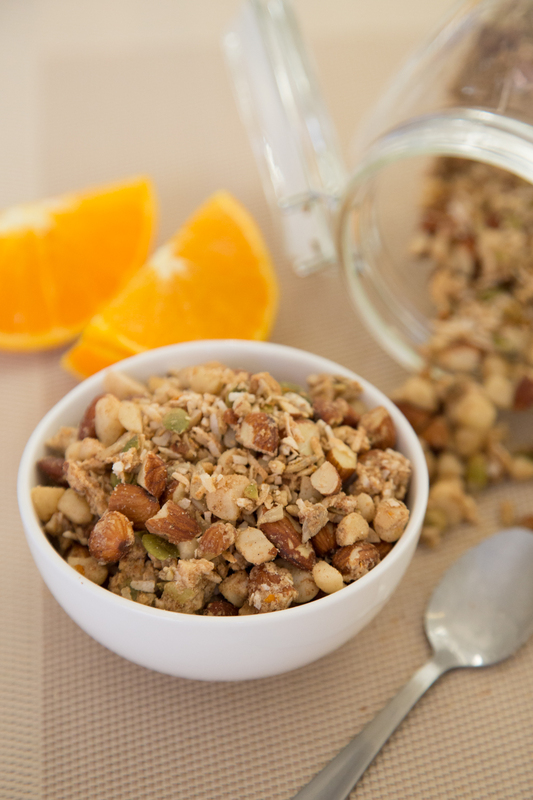 So this week’s recipe is a totally delicious Orange and Cinnamon Nut Granola that will make your house smell amazing and make you want to eat it like a snack by the handful. I’m not sure what inspired the orange and cinnamon combination, but it just sounded really yummy and a bit like a dessert. Granola is usually based on rolled oats, but as we’re grain-free this one is made with nuts, seeds and coconut. You can use any combination of nuts that you like, I went with almonds and macadamias. I do recommend activating your nuts beforehand to make them easier to digest, but if you’re pressed for time you can just throw it all together and you’ll have an amazing granola ready to eat in no time! This granola is sweetened with maple syrup so it’s also vegan friendly! 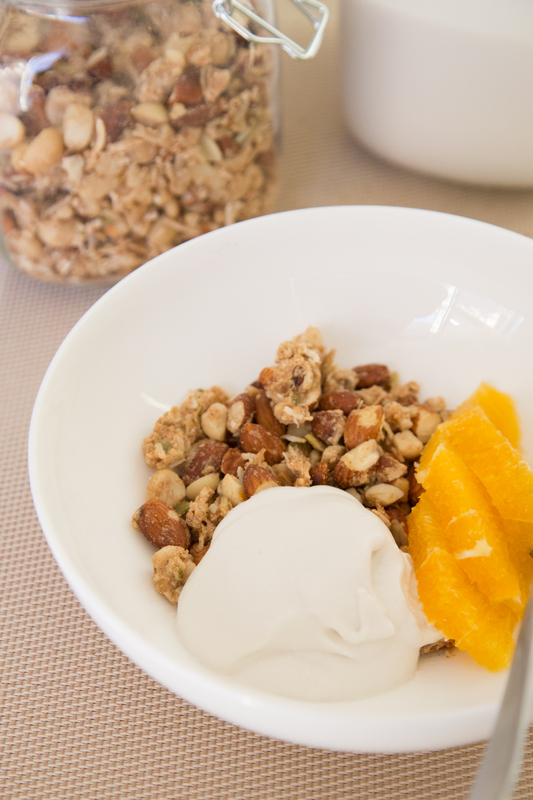 You can have your granola with coconut yoghurt (as below), nut milk or use it as a topping for rustic muffins and cakes. Or just eat it with a spoon! Combine the nuts and seeds in a blender and pulse until roughly chopped; I like mine with lots of whole pieces. Combine in a bowl with the coconut, cinnamon and orange zest. Mix together the nut butter and maple syrup and pour all over the nut mixture. Mix well to coat; and transfer to a baking sheet in a single layer. Bake for 25 minutes to start with and check; you want them nice and golden brown and toasted but there is a fine line between golden and burnt! In my oven I cooked for slightly longer at around 30 minutes. When they are ready, leave on the bench without mixing for 30 minutes to let the granola completely cool down and transfer into an airtight container.